With the rise in adoption of smartphones in the world currently, there has been an influx of mobile applications to achieve a wide variety of tasks. Some of the applications we use on a daily basis communicate with other systems to give us a seamless experience across multiple devices and platforms. How is this possible? Application Programming Interfaces (APIs) are responsible for this extended connectivity. They make it possible for mobile and web applications to interact and facilitate data transfer between them and other systems. In this article, we will discuss APIs, the best practices when building them and we will also build an API using the Test-Driven Development approach and Spring Boot framework. An API defines a set of routines and protocols for the interaction between software systems. Many mobile and web applications interact with servers that handle requests and respond to them - referred to as clients. As systems grow in size, they become robust and can become hard to maintain and make updates. By decoupling a system into several specific APIs, flexibility is achieved and the parts of the robust system can now be updated or deployed in parts easily without affecting the uptime or performance of the rest of the system. This results in a micro-services architecture, which is heavily reliant on API development. In such a system, APIs provide a mode of communication within the system and the various parts of the system can still interact and share the workload. Smartphones enabled us to stay connected and with their increasing power, we can achieve so much more. Internet access has also become more common, hence most smartphones are constantly connected to the internet. These two factors drive the usage of mobile applications that interact with web servers where APIs come into the picture. APIs facilitate the communication between mobile applications and servers and the rise in mobile applications usage has driven the rise of APIs. Web applications have also evolved over time and complexity has increased. This has, in turn, led to the separation of the presentation and logic layers of a normal web application. Initially, you would have both layers of a web application built together and deployed as one for use by the masses. Now, the frontend section is decoupled from the backend to ease the separation of concerns. APIs also enable companies to a single backend setup to serve mobile applications and web applications at the same time. This saves on development time and technical debt since the backend system is only modified at one point. Smartphones are also as diverse and companies now have to cater for multiple types of smartphones at the same time in order to provide a uniform experience to its users. APIs make it possible for mobile applications running on different platforms to interact in a uniform way with a single backend system, or API. It's really important to mention that APIs also make it possible for other developers using different programming languages to tap into our system for information. This makes it easier to integrate systems that use different programming languages. This, again, allows us to make modular applications, using various languages, tools and frameworks together to bring out the best of each. APIs also act as a point of contact with other developers' work since they can allow other developers to consume them for their own use. For instance, Twitter has exposed some of its APIs for use by other developers to build other Twitter clients and use the platform in other unique ways. Some have built bots on platforms like Telegram to send tweets or fetch tweets, all of which is achieved through APIs. This makes APIs important in the current and coming software ecosystems as they allow us to integrate with other systems in flexible ways. Not just APIs, but good APIs. It is paramount that our API is well built and documented so that anyone else that will consume it has an easier time. Documentation is the foremost important aspect of an API, it lets other developers know what it accomplishes and what is required to tap into that functionality. It also helps maintainers know what they're dealing with and make sure their changes do not affect or break existing functionality. HTTP Status Codes were defined to identify various situations that may occur when an application is interacting with an API. Informational Responses: 1xx statuses, such as 100 Continue, 101 Switching Protocols, etc. Success: 2xx statuses, such as 200 OK, 202 Accepted, etc. Redirection: 3xx statuses, such as 300 Multiple Choices, 301 Moved Permanently, etc. Client Errors: 4xx statuses, such as 400 Bad Request, 403 Forbidden, 404 Not Found, etc. Server Errors: 5xx statuses, such as 500 Internal Server Error, 502 Bad Gateway, 503 Service Unavailable, etc. These codes help the system and the people interacting with it identify and understand the nature of the events that occur and the causes of any errors. By adhering to the HTTP Status Codes in our APIs, we can make our APIs easy to interact and integrate with. Besides these, we can also define our own error codes for our APIs, but it is important we document them clearly to make it easier for the consumers and maintainers of the APIs. Before cars or phones or electronic devices are released to their users, they are thoroughly tested to ensure that they do not malfunction when in use. APIs have become more common and important, therefore, they also need the same amount of attention to detail. They should be thoroughly tested before being released to avoid malfunctioning while in production. Let us assume that we are building an app that helps users maintain a list of their cars. They will be able to add new cars, update existing cars, and even remove cars that they no longer possess. This application will be available for both Android and iOS devices and also as a web application. Using the Spring Boot Framework, we can build a single API that can serve all the three applications, or clients, simultaneously. 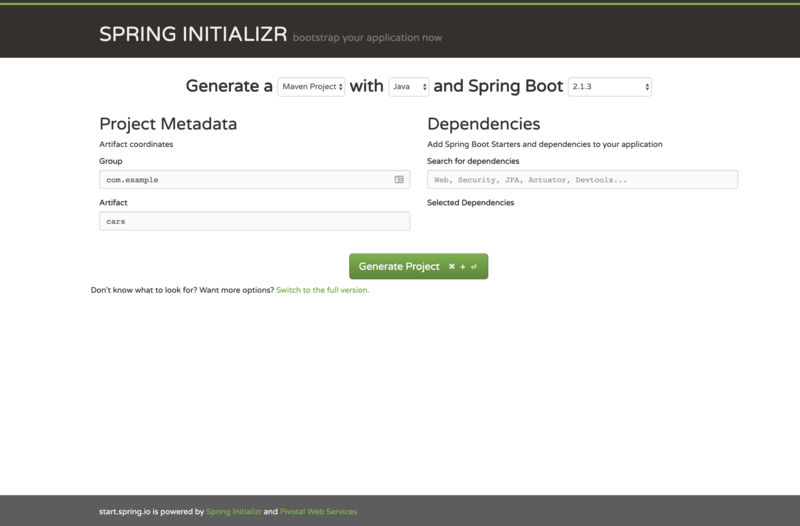 Our journey starts at the Spring Initializer tool that helps us quickly bootstrap our Spring Boot API in a matter of minutes. There are a lot of dependencies and packages that help us achieve various functionality in our APIs and the Spring Initializer tool helps integrate them in our starter project. The tool allows us to choose between Maven and Gradle, which are tools to helps us automate some aspects of our build workflow such us testing, running, and packaging our Java application. We also get the option to choose between using Java or Kotlin when building our API using Spring Boot for which we can specify the version. When we click on "Switch to the full version" we get more options to bundle into our API. A lot of these options come in handy when building Microservices such as "Cloud Config" and "Cloud Discovery" sections. Actuator to help us maintain and monitor our web application. With the dependencies set, we click the "Generate Project" button to get a zip containing our boilerplate code. At the root folder, there is a pom.xml file that contains the project configuration for our Spring Boot API. If we used Gradle, we would have a build.gradle file instead. It includes information such as the details of our new API and all its dependencies. We will mostly work in the main and test folders inside the source (src) folder. This is where we will place our controllers, models, utility classes among others. Let us start by creating our database and configuring our API to use it. Follow this guide to install and verify that MySQL is running. Some details of our service will be different from environment to environment. For example, the database we use during development will not be the same one that the end users will use to store their information. Configuration files make it easy for us to switch such details making our API easy to migrate and modify. This achieved through the configuration file, which in a Spring Boot API is the application.properties file that is located in the src/main/resources folder. We now need an entity class to define our API's resources and their details as they will be saved in our database. A Car is our resource on this API and what this means is that it represents our object or real life item whose information we will perform actions on. Such actions include Create, Read, Update, and Delete, simply put as CRUD operations. DELETE which we use to remove a resource and its information from our API. To better organize our code, we will introduce some more folders in our project at the src/main/java/com/example/cars/ level. We will add a folder called models to host the classes that define our objects. Note: I have stripped off the imports to make the code snippet shorter. Please refer to the Github repo attached at the end of the article for the full code. The tests simulate various actions that are possible on our API and this is our way of verifying that the API works as expected. If a change was to made tomorrow, the tests will help determine if any of the functionality of the API is broken and in doing so prevent us from breaking functionality when effecting changes. Think of tests as a shopping list when going into the supermarket. Without it, we might end up picking almost everything we come across that we think might be useful. It might take us a long time to get everything we need. If we had a shopping list, we would be able to buy exactly what we need and finish shopping faster. Tests do the same for our APIs, they help us define the scope of the API so that we do not implement functionality that was not in the plans or not needed. When we run our tests using the mvn test command, we will see errors raised and this is because we have not yet implemented the functionality that satisfies our test cases. In TDD, we write tests first, run them to ensure they initially fail, then implement the functionality to make the tests pass. TDD is an iterative process of writing tests and implementing the functionality to make the tests pass. If we introduce any changes in the future, we will write the tests first, then implement the changes to make the new tests pass. At the top, we have the @RestController annotation to define our CarController class as the controller for our Spring Boot API. What follows is the @RequestMapping where we specify the base path of our API URL as /api/v1. This also includes the version. Versioning is good practice in an API to enhance backward compatibility. If the functionality changes and we already have other people consuming our APIs, we can create a new version and have them both running concurrently to give them ample time to migrate to the new API. Earlier, we learned about the Create, Read, Update, and Delete operations in an API and how they are mapped to HTTP Methods. These methods are accommodated in the Spring framework as PostMapping, GetMapping, PutMapping and DeleteMapping annotations, respectively. Each of these annotations helps us expose endpoints that only perform the CRUD operation specified. The passing tests show us that we have implemented the functionality as desired when writing the tests and our API works. Let us interact with our API via Postman, which is a tool that helps interact with APIs when developing or consuming them. 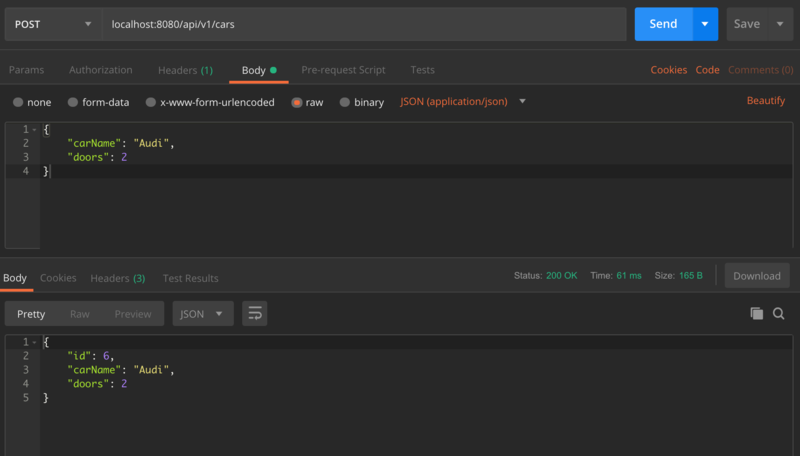 We have built and tested our API using TDD and now to make our API better, we are going to document it using Swagger UI, which allows us to create an auto-generated interface for other users to interact with and learn about our API. Next, we will create a SwaggerConfig.java in the same folder as CarsApplication.java, which is the entry point to our API. We have specified our response class as the Car class since it is the one that will be used to populate the details of our responses. We have done this because Swagger UI allows us to add information about the request payloads and response details. This will help provide more information about the payloads such as the kind of values that our API requires and the kind of response that will be returned. We can also specify mandatory fields in the documentation. 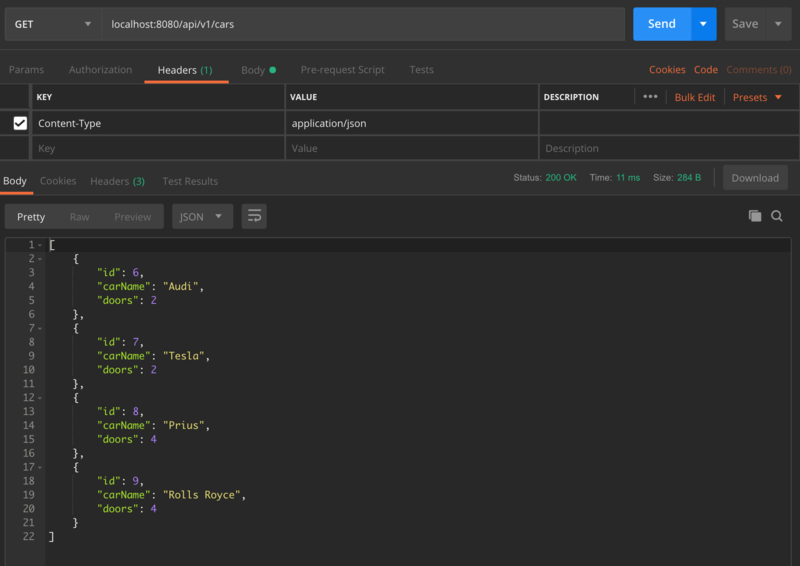 Swagger UI has documented all our endpoints and even provided functionality to interact with our API directly from the documentation. As can be seen on the lower right section of the screenshot, our example values have been pre-filled so that we can quickly test out the API without having to rewrite the values. Java is a powerful language and we have harnessed its power to build an Application Programming Interface, or API, using the Spring Boot framework. We have been able to implement four of the HTTP Methods to handle the various Create, Read, Update and Delete operations on the details about our cars. 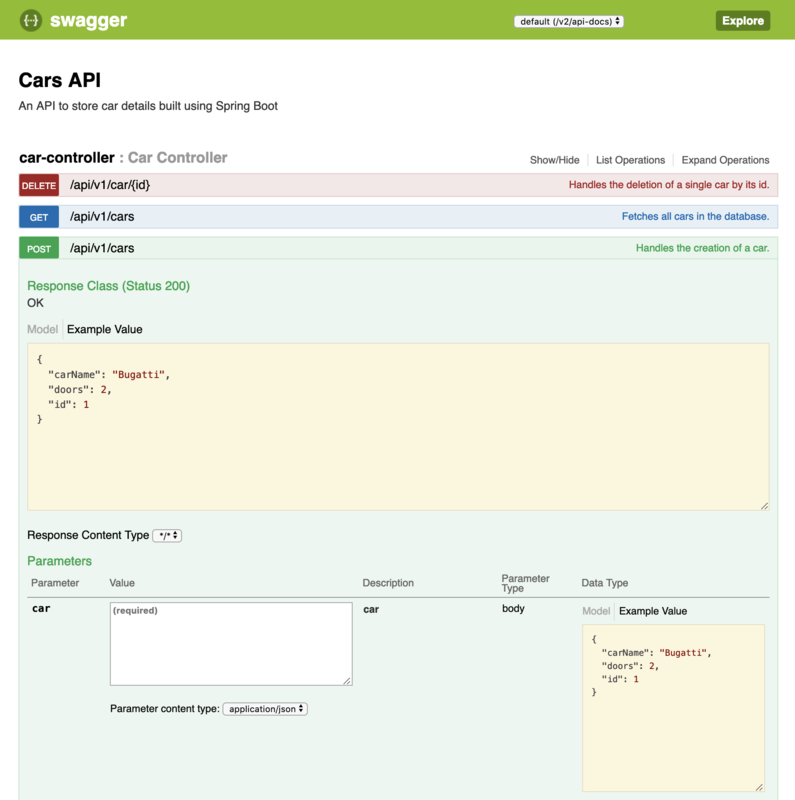 Swagger UI has also enabled us to document our API in a simple yet verbose and manner and have this documentation exposed as an endpoint in our service. Having noted the advantages of Test-Driven development, we went ahead and wrote tests for our endpoints and made sure our functionality and tests are aligned.